Imrat Khan is one of the most well known Indian musicians of our time. He traces his lineage back through a family of musicians to the court of the great Moghul Emperor Akbar of the sixteenth century. He trained on the surbahar with his uncle Usta Waheed Khan, and studied sitar with his older brother, the celebrated Ustad Vilayat Khan. Gayecki Ang [a vocal style of playing stringed instruments] has become a trademark of the gharana (musical "house") of Imrat and Vilayat Khan. Gayecki Ang involves an extensive use of a technique called meend wherein a player pulls sideways across the frets and allows for an entire musical phrase to be produced with a single stroke of the plectrum. Imrat Khan is renowned throughout the world, and maintains a busy travel and touring schedule. He performs regularly in the major cultural centers of Europe and the Americas, as well as in India, where he makes his home. Shafaatullah Khan accompanies his father on tabla with a sensitivity that is characteristic of the entire Khan family. Shafaatullah first began his training in sitar and surbahar, and later studied tabla in order to provide accompaniment for his father and his brothers, all of whom are string players. He performs regularly with them in international circuits, as well as with other well known musicians. He currently resides in the United States. Indian Classical music is one of the most developed forms of music to have emanated from our world. In many ways, especially as regards scale and rhythmic structures, it is far more complex than Western Classical music. Its improvisational aspects require and encourage performers to inject their own personalities into the music, without ever straying very far from the set melody and rhythm. In this way, a classical raga written hundreds of years ago may be rendered somewhat differently by any number of musicians over the years. These characteristics afford Indian Classical music a certain timelessness, and allow for a wide range of interpretations of a given composition. It has always been a sensitive issue as to when a musician should feel comfortable enough to compose his own rag. A musician might attempt this only after a long period of his life, after a thorough knowledge of perhaps hundreds of rags has been attained. A musician of such stature might then present his own composition. It does not suffice however, to merely compose a rag because in order to be thoroughly absorbed into the musical system, a piece must be played regularly and passed on through the generations until it achieves recognized status. 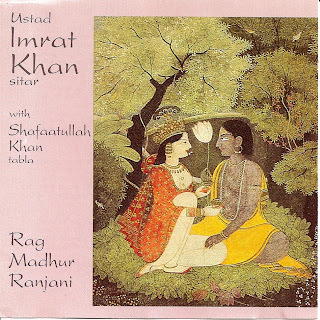 Although Imrat Khan is very well known for his surbahar playing, it was specifically requested that he render a performance on sitar for this recording. This request was graciously obliged, but it was not known until the day of the recording exactly which rag he would play. In Western music, it would be very difficult (if not impossible) for a producer to embark on a recording session without knowing which songs were to be performed. However, in the Indian tradition, many factors such as time of day, season, climactic conditions, personal feelings of the performer etc. regularly help to determine which piece will be most appropriate for a given performance. Madhur Ranjani was the perfect choice for this recording and it is rendered here with great passion and dexterity. The relatively diminished role of the tamboura, played sensitively by Irshad Khan, is used only as filler at crucial points in the rag, rather than throughout the entire performance. In this way, the silence that exists in between individual notes can be utilized to its greatest extent in order to create a tension and balance which are integral to the final effect of the piece.